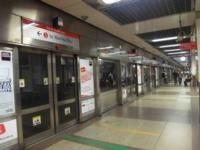 The first time you visit an MRT station, you’ll be astounded at its immaculate condition. Not one bit of graffiti. Nothing damaged, inside or outside. No sticky spots on the train floor, nor any trace of spilled coffee. You'll find it’s like this everywhere in Singapore. It feels as if you’re entering one of the island’s fine department stores: sparklingly clean, comfortably air conditioned and odor-free. Travelling by train is certainly an easy, inexpensive and efficient way to reach any of the island's major locations. Singapore's rail transit network consists of the MRT (Mass Rapid Transit) and LRT (Light Rail Transit) systems. The LRT is a fully automated line, serving as a feeder to carry commuters to MRT stations or bus interchanges. 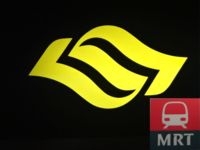 Assisted by the government, SMRT and SBS Transit are the two main companies operating the 158.7-km-long rail network (Land transport Authority- End year 2010). MRT and LRT trains run from 5:30am to 12:30am, with a reasonable frequency of 2 to 4 minutes during peak hours, and 5 to 12 minutes during off-peak hours. Morning peak hours: 7:30am to 10:00am. Afternoon and Evening peak hours: 5:00pm to 8:00pm. On weekdays between 12:00pm and 2:00pm, frequency is increased to less than 3.5 mins at the MRT stations. Bayfront, Bras Basah, Bugis, Chinatown, City Hall, Clarke Quay, Dhoby Ghaut, Esplanade, Lavender, Marina Bay, Orchard, Outram Park, Promenade, Raffles Place, Somerset and Tanjong Pagar. If you're a bit late and tap out between 7.45am and 8am you can still enjoy S$0.50 off the train fare. Only condition required is to tap in at a station different than the ones listed above. Visit LTA's Travel Smart page for more information on this offer and other ones. Please keep in mind that the stations are quite spaced out. If you try to walk from one stop to the next, it may take you at least 30 minutes. Using a journey planner tool will help you optimize your route and learn about train times and fares. The government offers affordable fares, to encourage Singaporeans to use public transportation. The public transport system uses Contactless SmartsCards (CSC) as a mode of payment for tickets. Children smaller than 0.9m (2’ and 11.43’’) don’t need a ticket. These cards can be purchased for S$12, which includes a S$5 non-refundable card fee, and a S$7 credit. Adult and child stored value Smartcards must be topped-up with a minimum stored value of $10. These can be used on buses and on the MRT and LRT. This ticket is valid for a single trip. It requires a S$1 deposit, refundable at any GTM or Passenger Service Centre at your alighting station. The Singapore Tourist Pass (STP) is an EZ-Link product, offering visitors and locals unlimited rides on MRT, LRT and basic bus services. It costs only $8 a day, and can be purchased at any TransitLink office or online. It can even be delivered overseas. The Singapore Tourist Pass is available in a 1-Day ($10), 2-Day ($16) or 3-Day ($20) format. An individual tourist is entitled to purchase only one STP at a time. 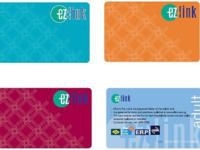 After the pass's expiry date, it can be returned to a TransitLink office or used as a normal Ez-Link adult card. In this case you’ll only need to top it up with some cash at any GTM or at any 7-Eleven convenience store. Please note that this pass is not valid for Express, Fast Forward, Night Rider, Night Owl, or Chinatown Direct. Changi Airport, Orchard, Chinatown, City Hall, Raffles Place, Ang Mo Kio, Harbourfront, Bugis, Lavender. 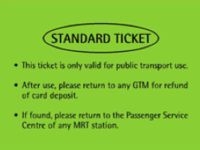 This card allows passengers to park their cars in a convenient Park and Ride (P&R) car park, then use any MRT, LRT or bus. P&R car parks are usually located near an MRT station, bus interchange or bus stop. 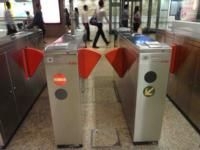 How to use your smartcard when taking the train? 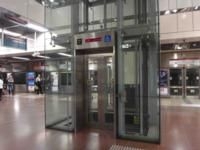 When entering or exiting a train station, you need to tap the card at the gate reader. The reader will display a green light to indicate that the fare has been paid and the pass is still valid. If a red light is shown, the gate won’t open, since your card may not be valid. You may want to approach the ticketing office or the Passenger Service Centre to renew or top up your pass. - TransitLink Ticket Office or Passenger Service Centre, with a minimum stored value of S$10. Cash payment only. - AVM (Add Value Machine). Net payment only. - GTM (General Ticketing Machine). Cash or net payment only. For cash payment, only notes are accepted. Exact amount is recommended, as change is not issued. The Changi Airport MRT Station is located in the basements of Terminals 2 and 3. If you arrive at Terminal 1 and wish to reach one of the other two terminals, you can use the inter-terminal travellators, a shuttle bus or a Skytrain. If you arrive at the Budget Terminal, a free 24-hour shuttle bus service connects the Budget Terminal to Terminal 2's basement, near the bay of public bus service 36. For more information about accessibility aboard the trains, please visit our dedicated page on Handicap Accessible Travel. For more information about safety on the trains, click here. The cleanness of the MRT stations is the result of an effective system of fines. • No smoking. Fine $1000. • No eating or drinking. Fine $500. • No flammable goods. Fine $5000. • No pets or animals. Fine $500. • No durians. A durian is a large fruit from southeast Asia, which has a distinctive, strong odour. • Always stand behind the yellow line on train platforms, or you may be fined up to $500. • Do not step onto the tracks, or you may be fined up to $5,000. In addition to its cleanness, the MRT network offers a remarkable display of modern art design. The artwork's theme, known as "Art in Transit," aims to develop appreciation of public art in an urban environment.